This film absolutely belongs to Cage, giving us his most unhinged and off-the-wall performance in years as the arguably deranged Gary Faulkner. He’s almost unrecognisable in the film, with a very unique (and not exactly accurate) vocal delivery, while sporting long white locks and a “great big bushy beard”! He’s clearly enjoying himself in this larger than life role and it certainly makes a change from all of those preposterously one-dimensional thriller roles he’s given us over the last several years. If we’re going by Kermode’s 6-laugh-test here, Cage makes sure that milestone is passed within the first 20 minutes. Outside of Cage, there isn’t much to report in the cast. The Goldbergs’ Wendi McLendon-Covey plays it completely straight as Faulkner’s love interest, while Russell Brand tries to make it all about him – understandable really, as he’s playing God. His humour didn’t work in the film, and his presence was jarring. But the humour of the film comes so thick and fast that even these uncomfortably unfunny Russell Brand appearances are quickly recovered by some unhinged Cage shenanigans. A lot of the film’s humour doesn’t come from traditional jokes or punchlines, but rather the premise itself. Cage does portray Faulkner as something of an eccentric madman and brings a lot of laughs just from his performance alone, but it’s the circumstance that creates the most humour – the mere idea of this nutter going to Pakistan with a samurai sword in an attempt to capture Osama. You simply could not make it up. Army of One was an unexpected delight. It was a perfect role for Cage to go full crazy, while also reveal his acting chops to us once again. I don’t care what anyone says, I’ll stand by this as a solid Nicolas Cage performance. The film is funny and utterly entertaining, and with this current obsession of being inspired by the ‘hidden figures’ of history, Gary Faulkner is a crazy and relatable hero we can all get behind. 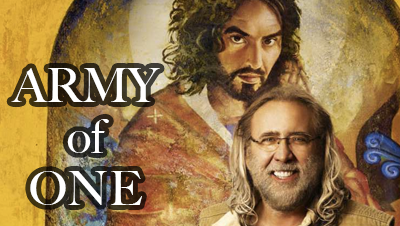 Army of One is Nicolas Cage’s finest film in years. I know that’s not saying much, but trust me – this one is a lot of fun.